The eight groups of Asian teams for the second qualifying round for World Cup Russia 2018. 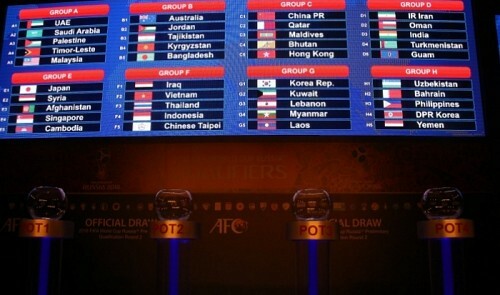 (Photo courtesy of the Asian Football Confederation). While there’s next to no chance of Taiwan emerging from the second round of qualifying for the 2018 World Cup in Russia, they could have done a fair bit worse in terms of the teams they drew in Group F. True, with a world ranking of joint-179th (out of 209 nations) with Cambodia, they are the minnows of the group but Indonesia (159) Thailand (142) and Vietnam (125) are not a million miles away. Meanwhile, while 2007 Asian champs Iraq are the clear favourites to top the group, at 79th in the FIFA world rankings, they are the lowest of the eight seeded teams. Right now, I’m not sure exactly where Iraq’s home games will be played. None of the Chinese or English press reports seemed to think of looking into this, though my good pal Jason “Adawai” Pan over at Taipei Times assures me this glaring omission in his report was due to space constraints. In 2011, the Iraqis played their first competitive game on home soil in almost a decade when they hosted Jordan in Erbil, Kurdistan in the first match of the third qualifying round for Brazil 2014. But a power outage and safety concerns led to matches being moved to Qatar. In 2013, FIFA allowed Iraq to resume hosting games in Erbil but, with ISIS just down the road, quickly though better of it and rescinded the order. So I guess these games will now be played in Qatar again. Alas, work commitments mean I probably won’t be catching Taiwan’s first couple of home games at Taipei Municipal Stadium (台北田徑場) against Indonesia on 11 June and Thailand on 16 June, though one can never say with certainty … (as I type, I feel a nasty delayed-reaction virus may be hitting me in, let me see, about eight weeks). One rather unsavoury note is the typical stereotyping that some sections of the media and apparently the fans have been engaging in. Hot on the heels of a controversy over an airhead “commentator” for a streaming service making disparaging remarks about Burmese players during a broadcast of an U23 event in Kaohsiung, the China Times has claimed Group F is being labelled the “Migrant Workers Group” (外勞組) by local footy fans (so that’ll be China Times reporters and their mates, then). At least they go on to tell us how the three “wailao” countries are big fans of the Beautiful Game and bound to provide vociferous support for their home countries at the games in Taipei. A friend protested that there is nothing rude about this and that the geniuses who coined this gem were “not looking down or snobbish” for using this “neutral” description. I can only wonder what the reaction would have been had the British press started labelling recent WC qualifying opponents Lithuania “a bunch of bricklayers” or what not. That kind of xenophobic slur over a football match just wouldn’t fly in good old England. Good to know about these rankings overall though!